Punch Brothers are really really great live, y’all! A fitting self-description, because what a month Thile is having. First, on February 7 and again on the 14th, he guest-hosted for Garrison Keillor on Prairie Home Companion – not the show’s first guest host, but the first time Keillor hasn’t even been present for the show. Then, in the middle of that on February 8, he won the “Best Contemporary Instrumental Album” GRAMMY along with Edgar Meyer for “Bass and Mandolin,” and was nominated for three more with both Meyer and Nickel Creek. Now his band Punch Brothers is back on the road in support of their brand new album, “The Phosphorescent Blues” (vinyl|CD). 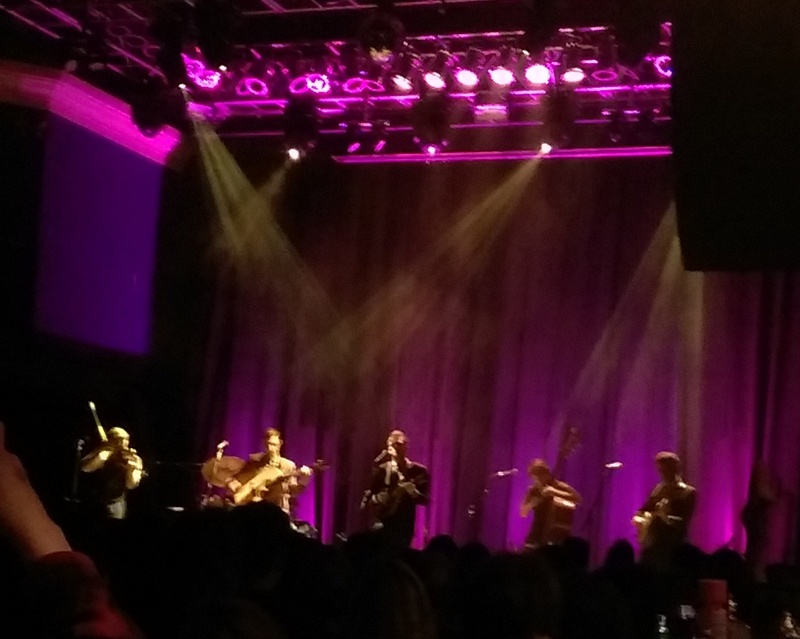 I was lucky enough to see them their third night at DC’s 9:30 Club for what Thile told the crowd was the first time they had ever played three nights anywhere, adding on the date after the first two sold out. And you guys, Punch Brothers can PLAY. 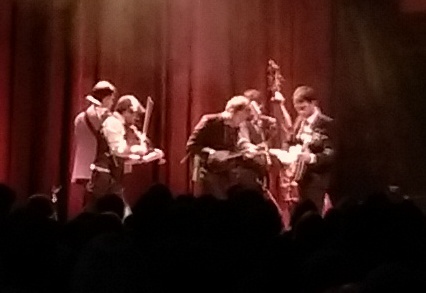 If you’re unfamiliar with Punch Brothers, they’re sort of a bluegrass-classical fusion band. You could also call them, although comparison descriptions are almost always unfair, the darker side of Nickel Creek. It would also be unfair to call it “The Chris Thile Show” because the other musicians are also great and are showcased well, but Thile is almost always the lead singer and his mandolin virtuosity does take center stage. This is even more true at a live show, where his raw energy can really take over (heck, even half the fun of May’s Nickel Creek concert was watching Thile rock out to “The Fox”). 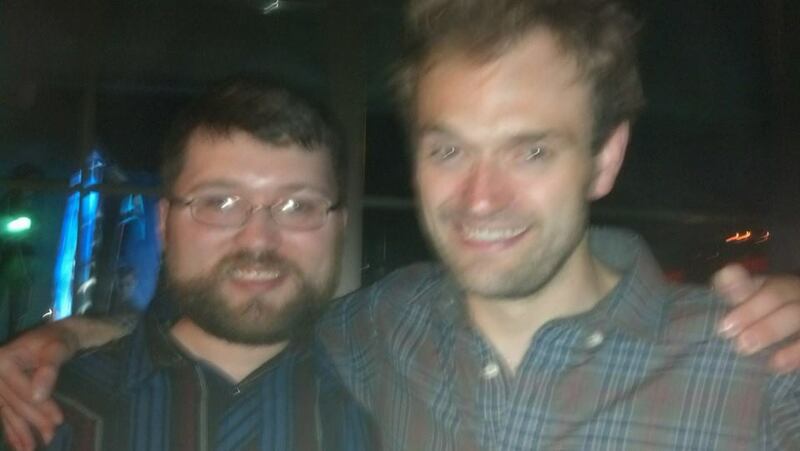 For what it’s worth, if you heard Thile hosting PHC, his stage persona was very much the same with Punch Brothers. The other band members each introduced a song and spoke a little, but it was mostly Thile. Two fun moments showcasing the rest of the band was when banjo player Noam Pikelny introduced the band’s instrumental arrangement of “Passepied” by Claude Debussy (which was what reminded me most of Perpetual Motion). He said that Debussy died tragically – “Tragically in that he did not live long enough to hear our arrangement.” Later, Eldridge announced a tribute to the Seldom Scene – his dad Ben’s legendary bluegrass band, and Punch Brothers did a great straight-bluegrass rendition of “Through the Bottom of The Glass” with Eldridge taking lead vocals and bass player Paul Kowert ripping off a really fun solo. The last thing I’ll note is how amazing the DC music scene can be – I have to imagine that artists are pleasantly surprised by the crowds they find here. Just like Sturgill Simpson’s show at the same standing-only venue a week before, the crowd was a mix of hipsters and country folks in the city with an even broader age spread. And just like with Simpson, they knew how to sing along, which seemed to thrill Thile to no end. The crowd started strong shouting “Oh Boy!” on the night’s third song, Rye Whiskey, and just didn’t let up – nor did the band. I don’t think anyone wanted the show to end. I certainly know I left feeling happy on the inside, even a little transcendent. I’ll review Phosphorescent Blues soon, but what I really look forward to is the next time I get to see Punch Brothers live. I’m really glad Thile is just 34 – this is definitely someone I want to spend the next 50 years listening to.